Good Practice focuses on the language and communication skills that doctors need to make consultations more effective, using five elements of good communication: verbal communication, active listening, voice management, non-verbal communication and cultural awareness. 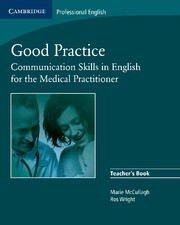 The Teacher's Book is an invaluable tool for anyone wishing to use Good Practice in the classroom. As well as guiding the teacher through the activities, each unit offers background information to the unit topic, notes on medical terminology, pronunciation guidance and suggestions for further reading. The Teacher's Book also offers 12 photocopiable related reading texts and photocopiable worksheets to use with the Good Practice DVD. 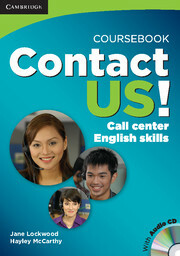 CONTACT US develops high-end professional English language communication skills for the BPO industry.